Kenji loves going outside when the weather is nice. She's only allowed out in the fenced backyard with parental supervision. She has to wear her collar with her city tag on it, just in case she sneaks out of the yard somehow. 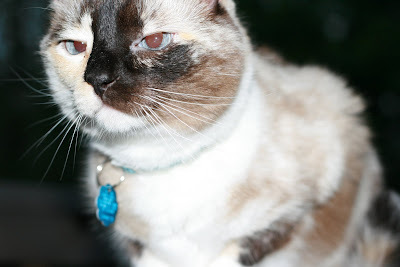 Her "necklace" and "pendant" match her blue Siamese eyes. Kenji wondered what her pendant said and I told her it said that she had her rabies vaccination and that it had a special number on it to help her get back home in case she gets lost. All this domesticity is a far-cry from Kenji's beginnings as a little streetwise kitten. Kenji wants to keep it real. She's decided that her new name is Rabies, because it sounds tough. And it already says Rabies on her pendant.